Giovanni Boccaccio's Decameron was the first great masterpiece of European storytelling; this brilliant new translation by J. G. Nichols faithfully captures its timeless vitality in readable and natural English. In the summer of 1348, with the plague ravaging Florence, ten young men and women take refuge in the countryside. There they entertain one another for ten days with tales of love, death, and deception, featuring a host of characters from lascivious clergymen and mad kings to devious lovers and false miracle-makers. 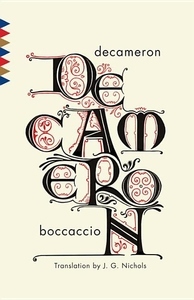 Named from the Greek for "ten days," the Decameron draws on ancient mythology, historical events, and everyday life, blending them into a treasury of tragic, comic, and outrageously bawdy stories that have influenced writers and entertained readers for more than six centuries.